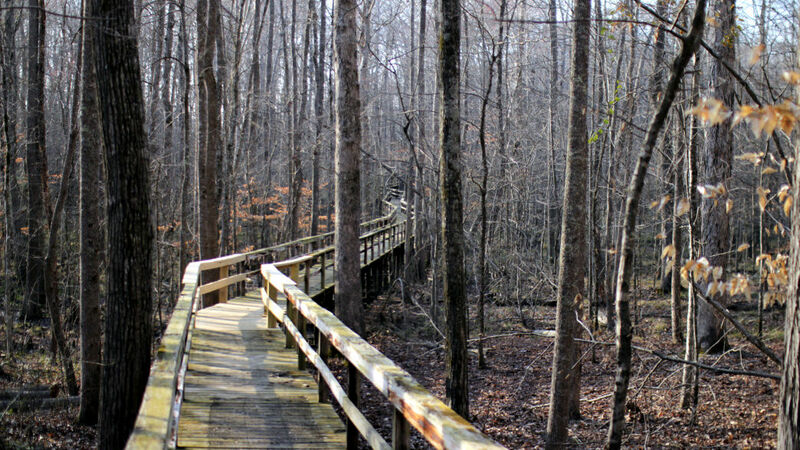 Once you’re finished riding, take a short walk on the boardwalk through Dismal Swamp. With 4,000-plus acres, two lakes, and 14 miles of mountain bike-friendly trails, Big Hill Pond offers an ideal escape from the city (and the crowds)—and it’s free to visit. The loop is fairly long, and considered intermediate in difficulty. Mostly fire roads. Plan for a couple hours, but it could take you a little less or a little more, depending on your skill level. Bordered by Cypress Creek and the Tuscumbia River, the 4,138-acre Big Hill Pond State Park is chock-full of opportunities for outdoor recreation. The park’s central features are its two bodies of water: Travis McNatt Lake (great for fishing) and its namesake Big Hill Pond. The 35-acre pond was created in the mid-19th century when a levee was built across the two adjoining creek bottoms for the Memphis to Charleston Railroad. Today, the bottoms have filled in with a spectacular cypress grove, and the park’s timberland and hardwood bottom land makes for gorgeous riding for mountain bike enthusiasts. Big Hill Pond offers a 14-mile mountain bike trail, mostly on fire roads and doubletrack, circumnavigating the 165-acre Travis McNatt Lake. Mountain bikers should park at the equestrian trailhead, just across the road from the park’s visitor center, and the loop can be ridden either clockwise or counterclockwise. Either way is going to have similar elevation gain and loss, which is very little. Regardless of which way you choose to ride, the highlight is the section between Travis McNatt Lake and the cypress-studded Dismal Swamp. Bikers can follow the short spur trail to a 70-foot-tall observation tower (it’s actually a refurbished fire lookout), which boasts panoramic views of both the lake and the swamp. It’s also worth taking a quick walk down the 0.8-mile boardwalk when you’re done riding. 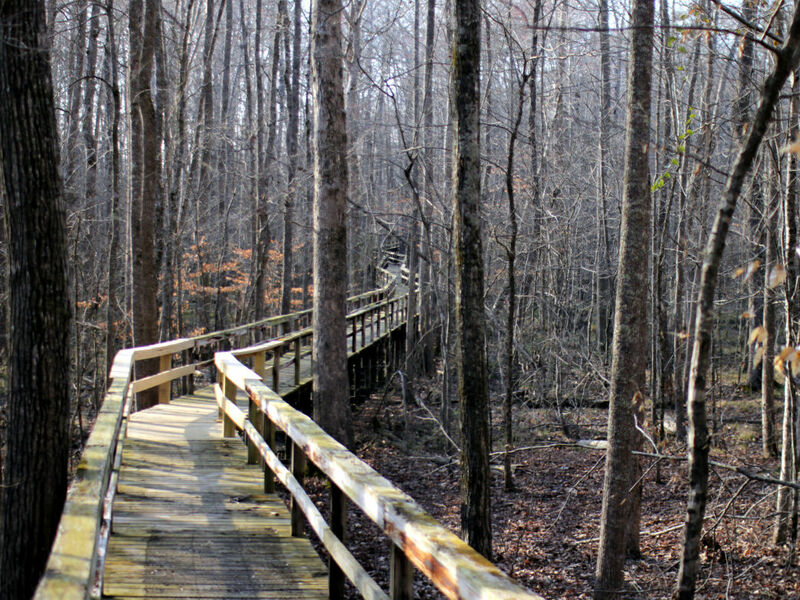 Walking directly through the swamp, you might even catch a glimpse of the park’s resident osprey in the spring or fall, or a bald eagles (they nest here year-round). The observation tower is right at the ride’s halfway point. After taking in the views, either head north for a ridgeline ride through the timber forest, or south along the old fire road back to the parking area. The trail is widely considered to be of intermediate difficulty—though it’s short on technical elements and elevation gain/loss, it’s fairly long for cyclists on knobby tires. Just an hour and a half from Memphis, the trail at Big Hill Pond is ideal for mountain bikers looking for a quick escape from the city. Though it’s not particularly demanding, the park’s scenery makes for pleasant riding, and there’s plenty to do in the area—it’s easy to make a day trip or a whole, family-friendly weekend out of a visit to Big Hill Pond. Best of all, the park is rarely crowded, so mountain bikers often have the trail to themselves. The park is located at 1435 John Howell Road in Pocahontas. From the park entrance (no fees charged), head south until the road forks, and take a left just before the visitor’s center. Park in the equestrian lot. Mountain bikers at Big Hill Pond share the red-blazed equestrian trail—no bikes are allowed on the white-blazed hiking trails. Local mountain bike groups stress that it’s important to be courteous and yield to horseback riders when you encounter them on the trail.